Lisa Marie Barber describes her work as “not simple compositions, but simple in concept and method.” Influenced by the Mexican Folk art and religious shrines of her upbringing and heritage, her ceramic sculptures and mixed media quilts are playful, celebratory meditations on the world around her. Originally from Tucson, AZ, Lisa Marie earned her BS in Sociology/Art minor at Northern Arizona University (1992) and MFA from the University of Texas at Austin (1998). She is currently a full professor in the art department at University of Wisconsin-Parkside, Kenosha. Prior to her work at UW-Parkside, she held a full-time (3-year) lecturer position at Santa Clara University and worked as a youth art instructor for the Palo Alto Art Center and San Jose public schools. 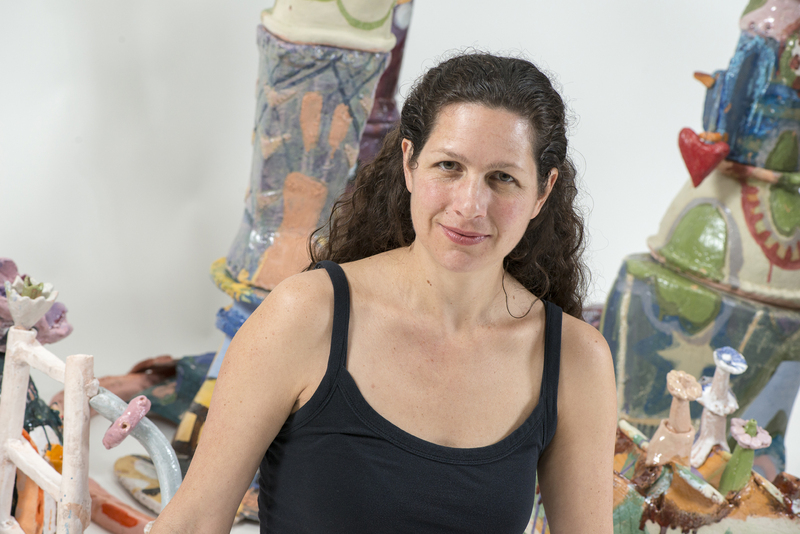 In addition to exhibiting nationally, Lisa has held visiting artist and/or residency positions at City University of New York, Hunter College; Northern Clay Center, Minneapolis; Watershed Center for Ceramic Art, Newcastle, Maine; and Mendocino Art Center, California. She has received numerous honors and led workshops from New York to California.